With a new year comes the perfect opportunity to pepper our kitchens with new gadgets. While food and cooking trends come and go, a useful piece of cookware can always earn its keep—whether it serves to actively improve our cooking, or simply to make our lives a little easier. As January draws to a close, we’ve rounded up a handful of kitchen gadgets we have our eyes on for 2018. Right, so yes, this is pricey for a thermometer and certainly pricey for a spoon, but hear me out. 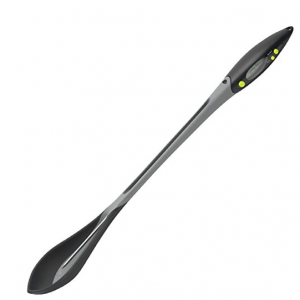 This multi-functional utensil is a digital thermometer—accurate to a tenth of a degree, by the way—housed in a silicone spoon. Which means you can stir and monitor the progress of any dish without fear of scraping that brand-new nonstick pan you just got for Christmas, or you can remove the thermometer from the spoon for use in checking the temps of meats, pastries, etc. You can choose from Celsius or Fahrenheit, set minimum and maximum temperatures, and the thermometer even memorizes your most recent settings, which can help to eliminate guesswork when you’re trying to recreate the dish you nailed last week. 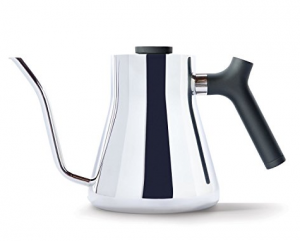 We just talked about espresso machines for home use, but this swanky pour-over kettle is another way you can immediately upgrade your personal coffee experience. Its chic design will look great in any kitchen, and the stainless steel body is suitable for use on electric, gas, and induction cooktops. The gooseneck spout does more than just lend elegant looks, it provides balance for a steady, smooth pour each time. Where there’s a new year there are resolutions, and where there are resolutions are vows to “eat healthier.” Enter this airfryer, which promises to deliver crispy deliciousness with up to 75% less fat than conventional oil frying. Yes, it’s pricey, but if you’re a fried food enthusiast looking to implement a change or two this year, it may be worth the investment. 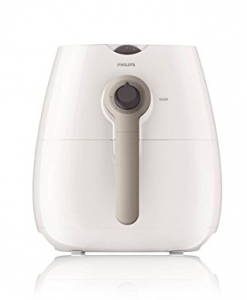 As a tip of the hat to its credibility, the Philips Airfryer is endorsed by Gordon Ramsay. Sure, you can dehydrate foods in a low-temp oven, but having to leave the door cracked open isn’t exactly energy efficient. 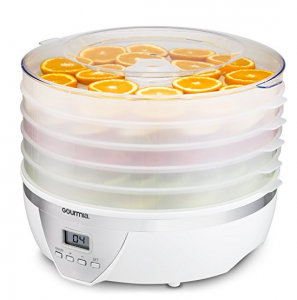 Introduce new flare to your cooking or baking projects this year with an easy, at-home dehydrator. This one has five trays to allow for variety and time savings, and the digitally controlled temperature and timer ensures accuracy beyond peeking into the oven every 20 minutes. Dry fruits and veggies, make your own jerky—the possibilities are endless. The machine even comes with a cookbook for ideas and inspiration. I’ll be the first to admit that it’s difficult to position a waffle maker as a “must-have” item, because how many of us have owned waffle makers that end up shoved to the back of a cabinet because they’re just too much hassle to use? The mess involved with pouring batter onto the iron is pretty much a given, so it often ends up feeling like more work than it’s really worth to make those Saturday morning waffles. 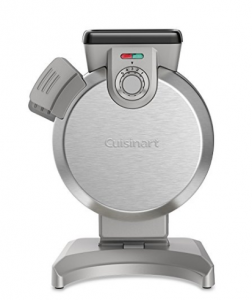 But with a brilliant vertical waffle maker like this one, mess no more! Just pour the batter in the top and rotate for perfect, fuss-free waffles. Five levels of browning and ready-to-bake/read-to-eat indicator lights make it easy to customize your waffle just the way you like it. 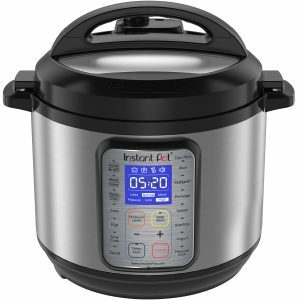 It’s true, we’ve talked about the Instant Pot quite a bit and even recommended it on our holiday gift guide, but I’m bringing it back again because the this machine continues to delight just about every home cook who uses it. Pressure cook, slow cook, saute, make yogurt, even bake a cake—there’s little that the Instant Pot Duo can’t do. Let it help you revolutionize your 2018 cooking like few other gadgets can. Don’t let the modest price point fool you, this little device is a handy helper in the kitchen. Poach or boil up to seven eggs according to your desired level of firmness with ease. 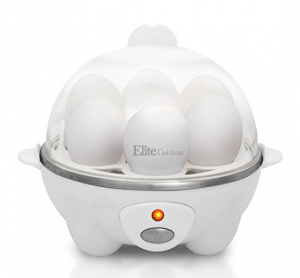 The machine comes equipped with a poaching tray, omelet tray, egg rack, and measuring cup to help you prepare perfect eggs however you like. There’s a built-in cooking timer and an auto-off safety function to ensure accuracy and ease of use. No more boiling pots of water and haphazardly timing eggs with your phone’s stopwatch app. Anyone who has smelled the remnants of garlic on their fingers two days after prepping Monday’s dinner (despite repeated hand-washings) will appreciate this handy tool. 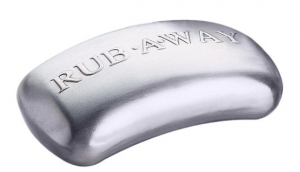 The Rub-A-Way bar removes any odor from your hands, even persistent smells like fish, onions, or the aforementioned garlic. Just rub it with your hands the way you would any other bar of soap and the smell dissipates, with or without water. It’s long-lasting and reusable, you can even pop it into the dishwasher to freshen it up. A must in every kitchen!